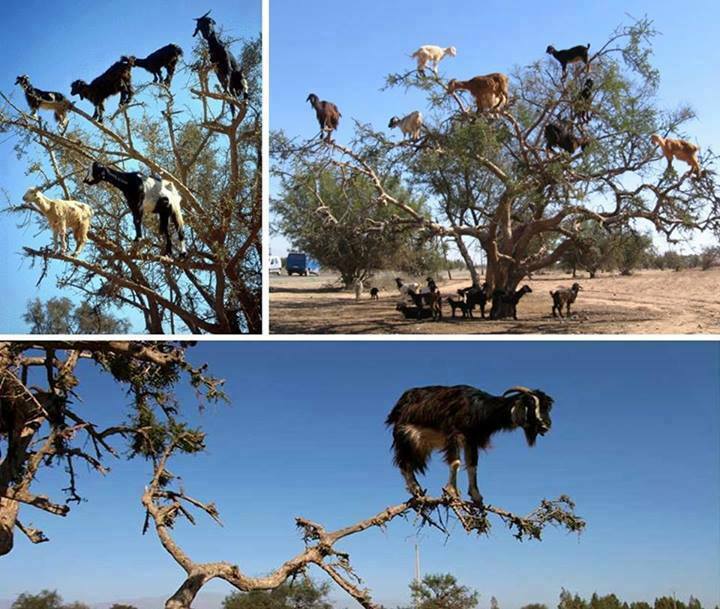 Found in Morocco, they climb these Argan trees in search of food. It's hard to imagine that animals with hooves could be so adept at climbing, but these images are 100% real. Food is fairly sparse in this area, so they have to grab it when they can - even if it's high up in a tree! The secret to their ability to climb lies in the shape of their hooves. The keratin reinforced hoof wall adds strength, while the soft textured sole provides traction and grip. It's also capable of deforming inwards to counter irregularities in the terrain. Their toes are capable of operating independently giving them more of a "grip". These hooves evolved to allow the goats to climb rocky, mountainous areas - but they've shifted ecosystems to the trees!